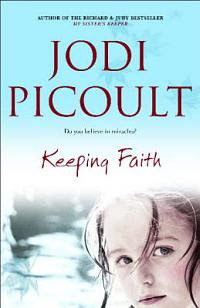 Oh, while Mom & Dad were up and we spent so much of our time lazing next to the pool reading, I finished Jodi Picoult's Keeping Faith. When seven-year-old Faith White and her mother, Mariah, swing by the house on the way to ballet class, they find that Daddy is home and he's brought a playmate. This is not the first time he's been caught cheating. After the fuss and feathers have settled and Dad has moved out, Faith begins talking to an imaginary friend who, it seems, is God. And God is not male but female. Faith is able to effect miraculous cures and is also occasionally afflicted with stigmata. When the media gets wind of this, the circus begins. The local rabbi takes an interest (Faith and Mariah are technically Jewish), and the local Catholic priest pays several inquiring visits. There is also a gaggle of psychologists. Throw in a professional atheist for the romance angle and a vicious custody fight with an egomaniacal lawyer, and you have a riveting read. Picoult gets better and better with each book. If you can suspend disbelief on one or two points, this is an entrancing novel. I really enjoyed this one, especially since I didn't have many expectations of it. I didn't enjoy her book The Pact at all and she has definitely become the season's 'it' writer - which puts me off instantly. But I did enjoy this one. The conclusion isn't earth shattering and she doesn't even bother to explain what is really going on, but that wasn't necessary and I'll forgive it ;) Besides, I'm sure if she did try the book would become ridiculous - kinda like when you get to see the aliens at the end of M. Night Shyamalan's Signs and it just becomes completely silly because they don't look scary at all, in fact they were rather comical. Sometimes it's best to leave things to people's imaginations ... the trick is knowing when. Hmmm, still many things to ponder. I guess now it's about finding closure & making it stick. Sometimes you think you've found it and you're there ... until something else happens. I'm pretty sure there'll be moments like that this weekend & next week as I move the rest of my things out of his place and next year when we have to find a way to deal with the flat we own together. Damn, the practical stuff makes it harder. Who keeps the fish?